NICOLA STURGEON has given her strongest warning yet that she will call another independence referendum if Scotland is ripped out of Europe’s single market. The First Minister will shortly unveil a plan to try to stay in the trading alliance which allows Scots firms to sell goods and services to 500 million people across the EU. Miss Sturgeon said the “time is coming to put Scotland’s future in Scotland’s hands” and warned if the Prime Minister rejected her single market blueprint then she would “make sure that Scotland gets that chance”. 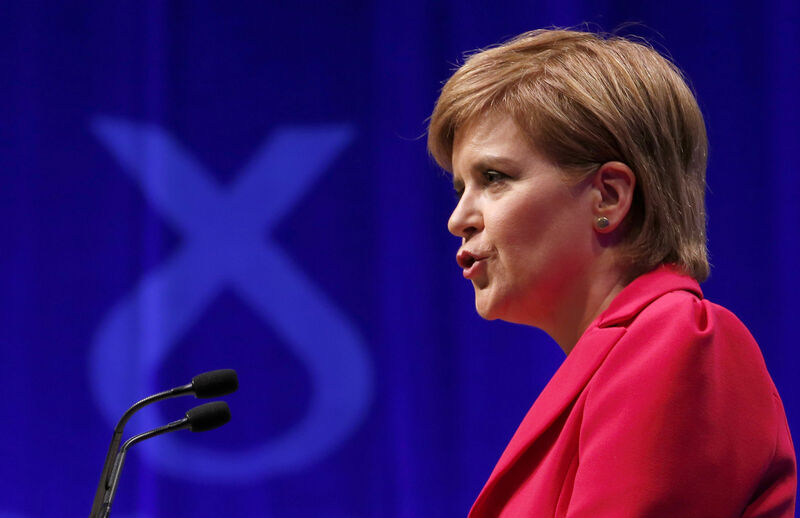 The SNP leader also used her flagship speech to the Nationalists’ conference to announce a childcare shake-up, a review of the care system and new measures to bolster the economy. The Scottish Government will this week publish a draft Referendum Bill for public consultation and is working on a range of proposals for what Scotland wants out of the Brexit deal, including access to the single market and a separate immigration policy. She said: “We will work with others across the political divide to try to save the UK as a whole from the fate of a hard Brexit. We will propose new powers to help keep Scotland in the single market even if the UK leaves. living standards and damages our reputation as an open, welcoming, diverse country – then be in no doubt, Scotland must have the ability to choose a better future. Think-tanks have claimed more than 80,000 jobs are at risk if Scotland leaves the single market, but a string of constitutional experts have claimed it would be impossible for Scotland to stay within the trading alliance if the rest of the UK has left. Miss Sturgeon used the bulk of her speech to announce a number of new Scottish Government initiatives, including a big shift in NHS spending. The First Minister revealed that by 2021, an extra half billion pounds will be invested in GP practices and health centres. This means, for the first time ever, half of the health budget will be spent in community health and not acute hospitals. An SNP idea to give a “Baby Box” of essential items for all newborns will get under way in pilot areas of the country on January 1. And then next summer every newborn baby across the country will receive the box full of clothes, nappies, bedding, books and toiletries. Miss Sturgeon also announced changes to under-fives childcare provision. Parents will be given greater choice on the nursery or childminder that best suits their needs and then get their local council to help fund it. Families will also be able to opt to receive funding in a “childcare account” and then use it to pay for a suitable place directly instead of individual nurseries applying for funding on behalf of them. Elsewhere, Miss Sturgeon used her speech to reveal how she had been impacted by meetings with dozens of young people who grew up in care. Continuing, the First Minister revealed she would launch an independent, root- and-branch review of the care system. She said the Scottish Government would set up a new Board of Trade, along with a trade envoy scheme where prominent figures from the business world and other communities would help promote Scotland overseas.